Steel Guitariste Country US né Noel Edwin Boggs, le 14 Novembre 1917 à Oklahoma City (Oklahoma). Noel Boogs à joué avec Hank Penny, Bob Wills, Spade Cooley et Jimmy Wakely. Il est décédé le 30 Août 1974. One of the finest steel guitarists in country music's history, Noel Boggs incorporated jazz influences — from his friend Charlie Christian — into Western swing on his over 1,000 sideman credits. Born in Oklahoma City on November 14, 1917, he began playing guitar as a teenager; by the time he had graduated from high school, he was playing on three different radio stations around Oklahoma City. Boggs toured with Hank Penny's Radio Cowboys during 1936-1937, but was back in Oklahoma by 1937. He played with Wiley & Gene and Jimmy Wakely during the late '30s and formed his own band in 1941. 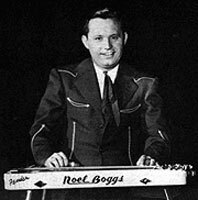 By 1944, Boggs joined the king of Western swing bands, Bob Wills & the Texas Playboys. He replaced Leon McAuliffe in Wills' band and played for two years, appearing on many of the Tiffany Transcriptions and several Columbia sessions. Boggs left in 1946 to join another Western swing giant, Spade Cooley. He played with Cooley's Dance Band until 1954, but suffered a heart attack just one year later. 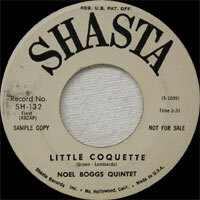 He couldn't play for three months, but formed the Noel Boggs Quintet in 1956. The band recorded several albums for Repeat during the '60s, but a series of heart attacks later limited Boggs' energy to record and tour. He died in 1974.